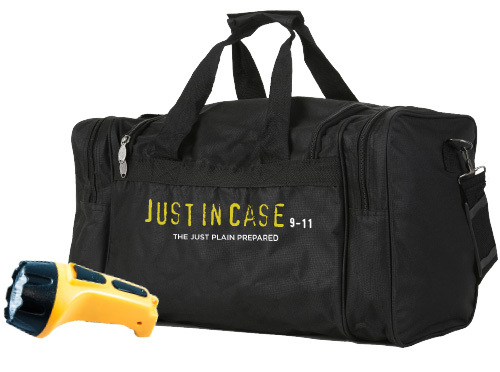 Give a new identity to Just in Case, a line of handbags and duffle bags filled with emergency kit-like items for life's mishaps and small emergencies. 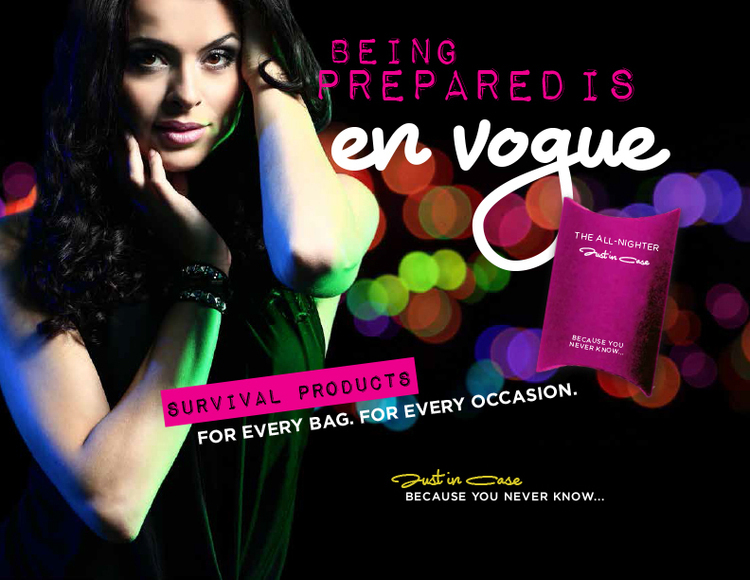 The company had also hoped to sell higher-end designer couture handbags in the future filled with similar emergency kit items, and they also eventually wanted to offer a more rugged line of high-quality duffle bags as natural disaster readiness kits, filled with things like emergency supplies of food and water, flashlights, batteries and such. Identity and products had to be delivered in new packaging for a huge trade show in 12 days. 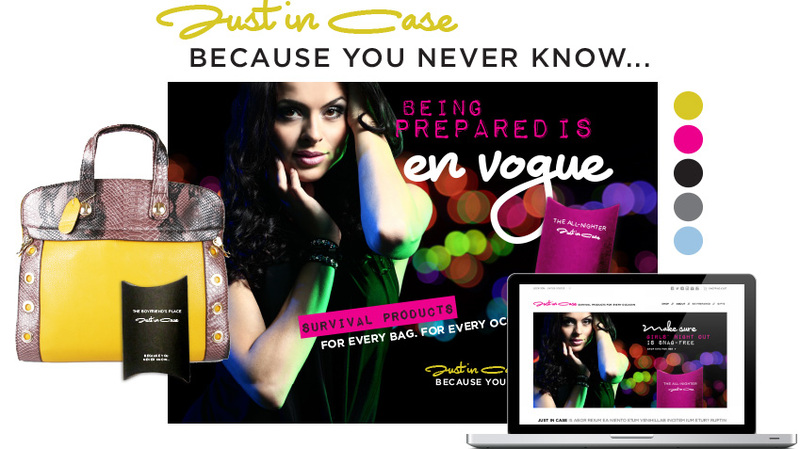 The premise, and the original taglines for the brand were clever: 1) Because you never know..., and 2) Bags for every occasion — but the bags themselves had problems. Mostly, they were too big, too expensive and not attractive enough to be someone's go-to bag for an evening out. “Bachelor Bags” were filled with typical things you’d need for a wild night out and the aftermath — including condoms AND antacids — but the high-quality duffle bag and logo embroidery kept the price point at $55 US, and didn't look modern. The price point was too high for most people for the convenience of having a bag full of toiletries they'd probably only use once. The eventual goal was to offer higher-end and couture bags filled with emergency items, but this brought along with it the task of predicting trends and what women will want to carry. 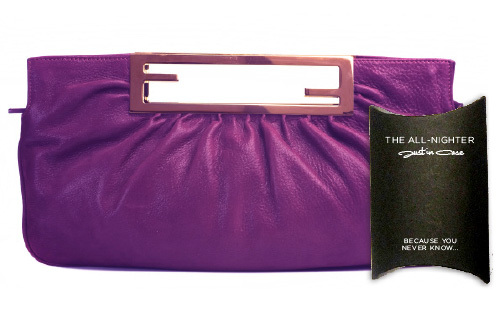 The bags would have to be captivating enough to make a woman chose them over her favorite evening bag on an evening out. 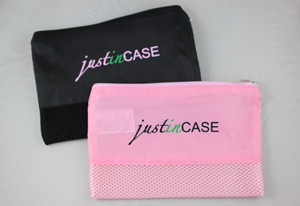 This gave the company then the task of not only creating kits, but being handbag buyers or designers as well. And the Ladies' Night bag looked more like a cosmetics case, and not an evening bag. Certainly not fit for a night out on the town. It didn't look modern and wasn't enticing to users to learn more about the products. The Ladies' Night Out Bag, $35. BEFORE: Original web site, built on GoDaddy Site Builder. So, instead of asking consumers to buy an expensive bag, I imagined these as kits small enough to fit into a bag the consumer already owns and loves, packaged in cardboard pillow boxes. This brought down the price point considerably, and also generated much, much more consumer interest. Also, the disposable nature of the packaging increased a desire for repeat sales, while still managing to look chic. The logo got a unisex new look and fun names, including: The Office Assistant, which included items like Shout wipes for lunch mishaps, a non-perishible snack for unexpected overtime, safety pins for wardrobe malfunctions, breath mints, and asprin for headaches. The boxes came in two sizes: Mini-kits small enough for a handbag, and medium kits, for fitting into a larger bag, briefcase or luggage. This led to a revamp of one of the tag lines. Instead of "Bags for any occasion," they became for "For every bag. For every occasion." For the web prototype I also created product categories for weddings and for men. The wedding kits came with variants for both the bride and the groom, as well as the wedding party, to encourage group sales as favors. "Wow that's actually a cool idea. Are they in stores yet?" "That reminds me now of something I'd find at Neiman Marcus. It looks expensive. It looks cool. It looks like luxury, and it's somehow cheaper. I think Neiman's when I see it." "If you'd done THAT transformation for my company, I'd say you just saved my business. I'd buy THAT. 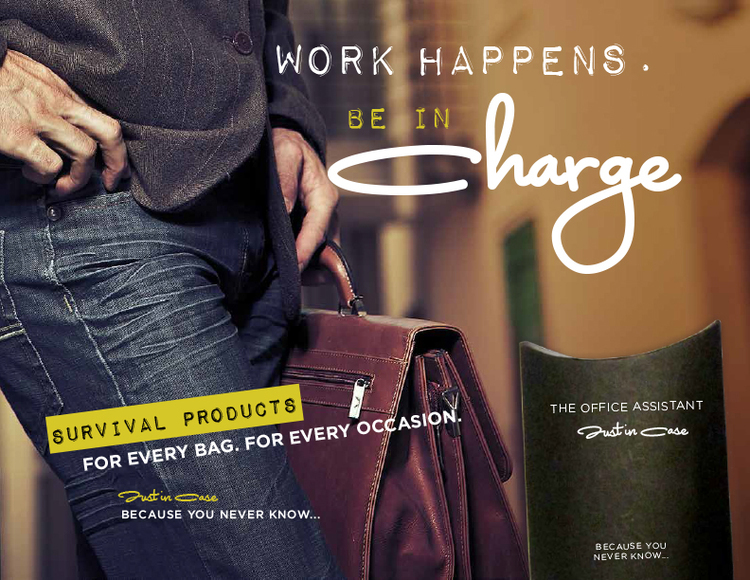 Especially to keep in my desk at work." Get in touch with Delia and get started today, it makes all the difference between between a brand you like and one that thrives.